Trip difficulty: 3 of 5 possible. Incredible hiking in East Iceland & visit to Mývatn lake. 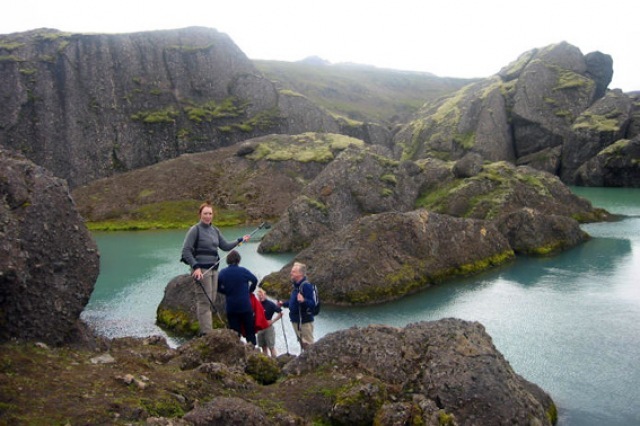 We will spend our five days hiking exploring Iceland’s awe-inspiring east fjords and the hidden gems of Víknaslóðir, or the “Deserted Inlets” in and near the Borgarfjörður Eystri. There the imposing and colourful mountains meet the ocean creating deep fjords littered with secluded alcoves along magnificent coastlines. 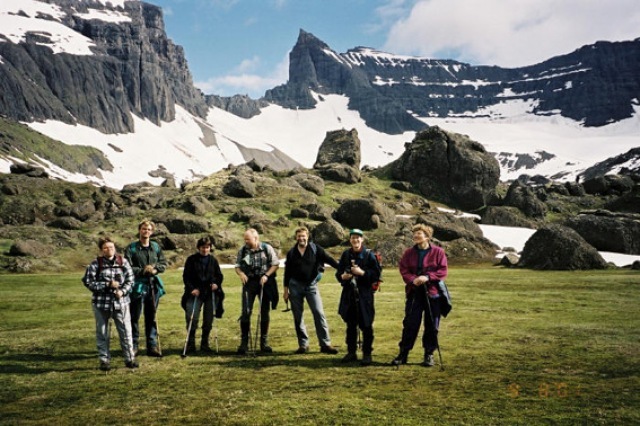 Among Icelanders the vicinity of Borgarfjörður is known for its great natural beauty and incredible hiking routes but it is still untouched by mass-tourism. This isolated region is also considered to be a central province of the elves. In the Álfaborg fortress (Elf-hill) their queen has long resided, governing and watching over her realm. 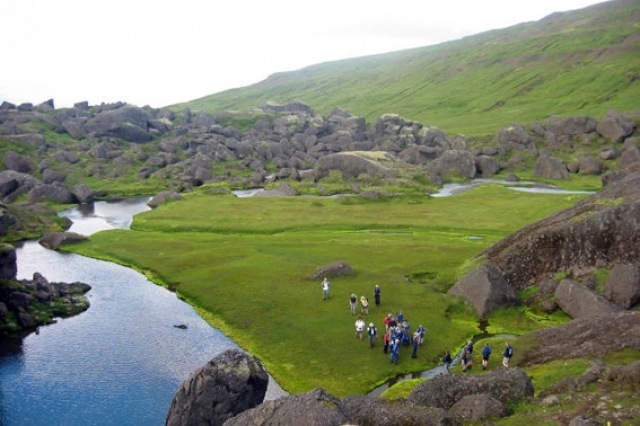 After our treks in the east we will cross over to the incredible Mývatn lake visiting en route the still steaming lava field of Leirhnjúkur and end the trip in the charming town of Akureyri. 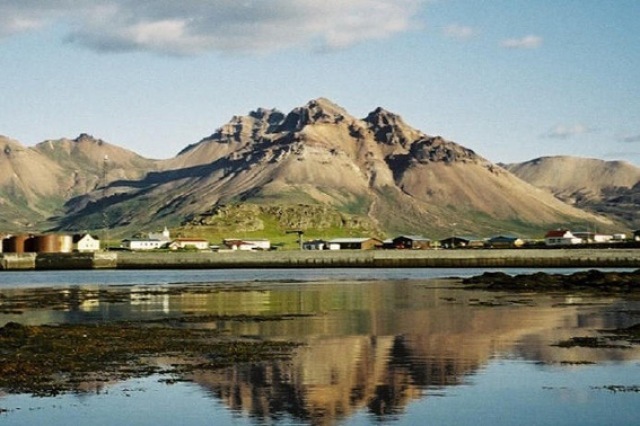 Your visit to Borgarfjörður and Mývatn is not soon forgotten; the amazing views, the deep fjords, the mystic elf sites, the lava fields, the breath taking lake and the picturesque fishing village and it surrounding farms will stay with you for years to come. Don’t forget your camera! Included: Flight from Reykjavík to Egilstaðir and back, accommodation in a double room with toilet facilities, made-up beds, full board, museum admissions, a local guide and all transport included. Groups minimum 2 to maximum 14 participants. Bring with you: ask for an equipment list. See detailed itinerary below. Day 2 to day 6: Hiking in the Borgarfjöður Eystri area. Day 7: Sightseeing and hiking in Möðrudalur and Mývatn lake. Day 8: Early drive to Akureyri and flight from Akureyri til Reykjavik. Along the way we will enjoy the hospitality of local people through their services, their knowledge of the area and its culture and their fresh food at their local restaurants. Bird watching is a frequent pastime on our routes, and sidetracks will take us to deserted inlets that tell us the story of a past far removed from mobile phone contacts. The walks are rather medium, so that anyone able to go for 3-4 hours Brisk walk can join the tour. On the other hand we recommend that you exercise during at least the week or two before your tour, for example by taking brisk walks of 1-2 hours, 3-4 times per week. Please read the following brief description of the daily program. Arrival from Reykjavík to Egilsstaðir airport with evening the flight normally departing at 20:00 in the evening. One hour drive together to Borgarfjörður to our locally owned Elf guesthouse where we will stay next 6 nights. 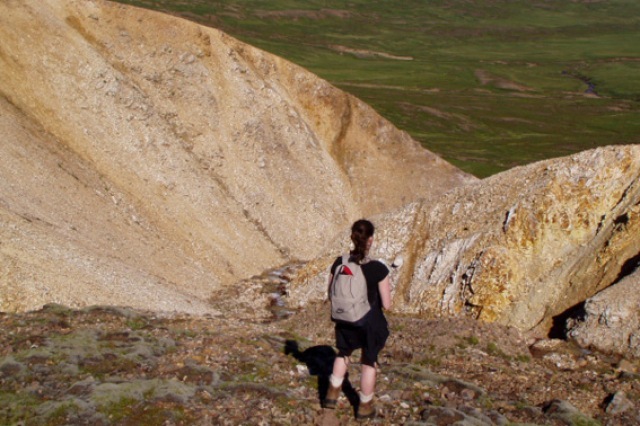 Info: A somewhat difficult hike because of gravelly areas and screes on about 15% on the way. Around 16 km. Traverses 500 m of elevation. 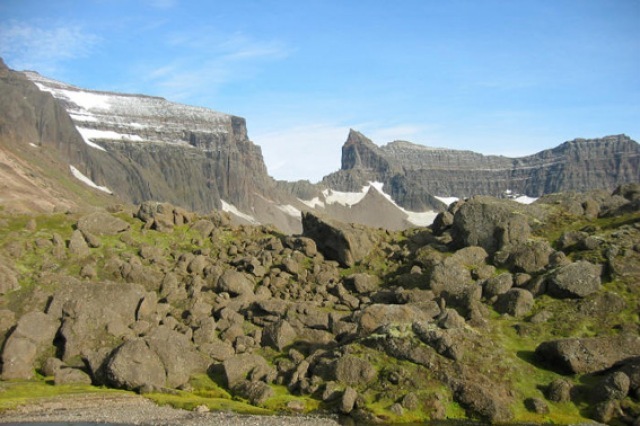 From Vatnskarð pass (431 m), we start the day’s hike by going up and crossing the mountain Geldingafjall (640 m), then continuing inland west of Súlur peaks. 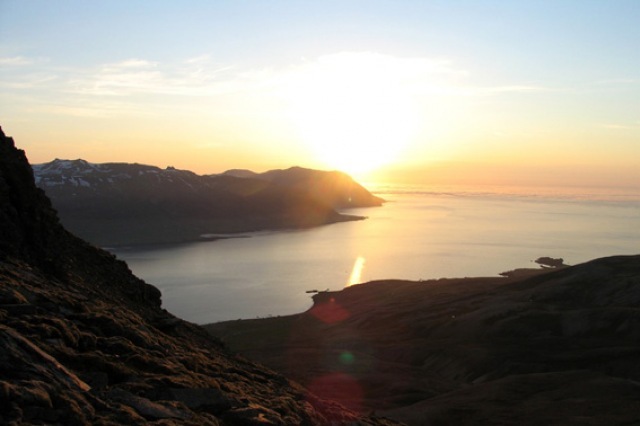 There are excellent views over Njarðvík, Fljótsdalshérað valley, the black sandy beach of Héraðsflói bay and perhaps even to Vatnajökull glacier and Mt. 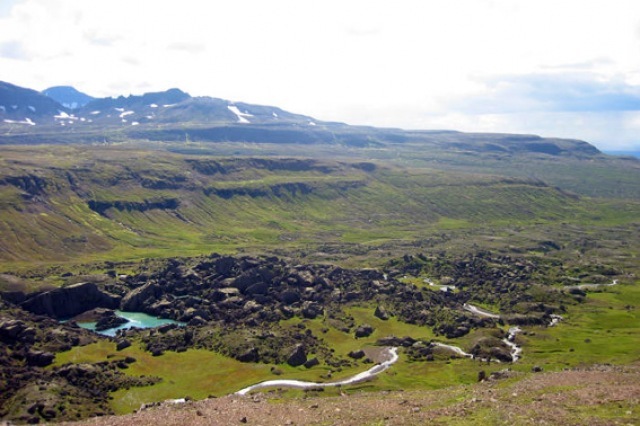 Snæfell in the eastern part of the central highlands. 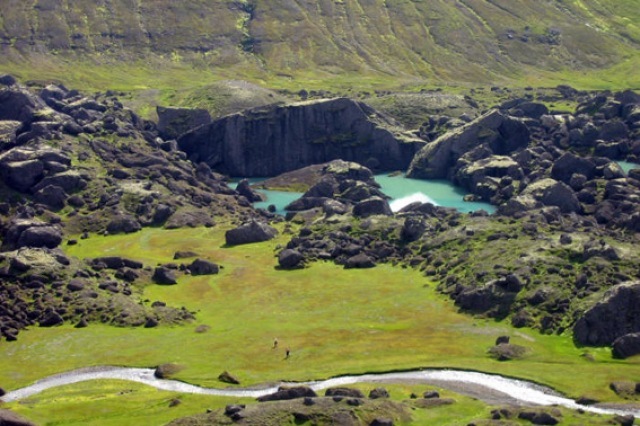 We then go down into Stórurð, an expanse of enormous rocks intersected by a small river. Calm turquoise-coloured basins of icy water lie hidden among the huge boulders, often with flat banks of short, tender, green grass. 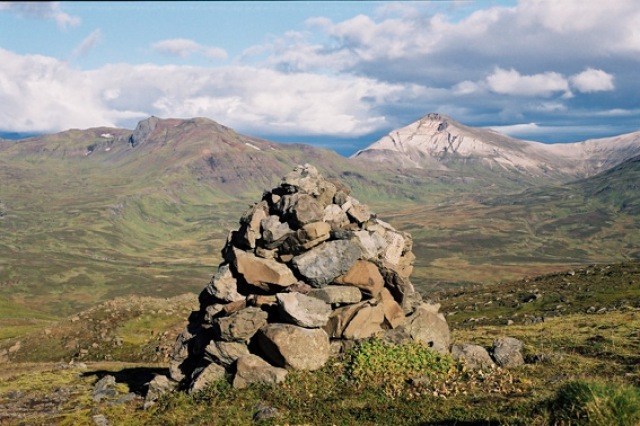 Returning from this mysterious place, we can opt either for the hike along the Dyrfjöll (Door Mountains) or the easy way down the valley below Rjúpnafell peak. 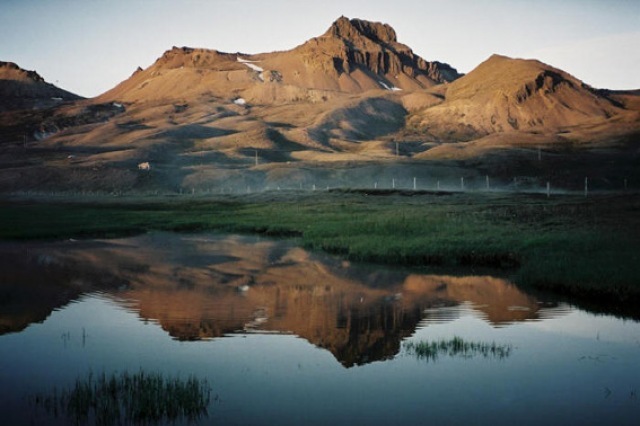 Info: Hike around 11 km, traverses 415 m.
We 15 minutes drive from Borgarfjörður and stop at Unaós farm. 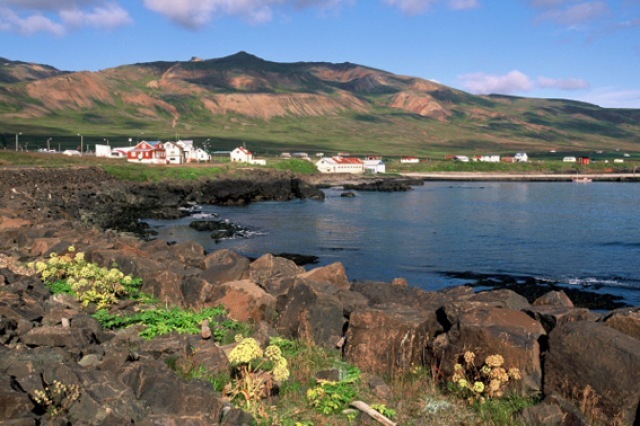 We hike along Selfljót river to the seashore and to the Stapavík cove, a former unloading place for ships. From Stapavík we take a rather easy hike along Gönguskörð pass largely along an old riding trail. This was the main route between Borgarfjörður and Fljótsdalshérað valley for 1000 years, until the road over Vatnskarð pass was finished in 1955. Pick up at Njarðavík farm and drive to Borgarfjörður. Info: Easy hike of about 15 km. Traverses 400 m of elevation. 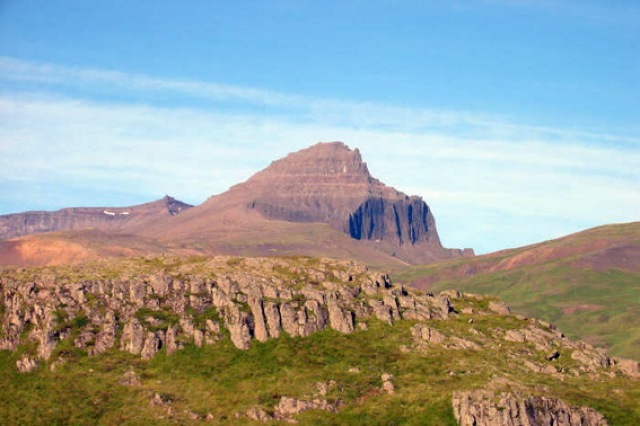 Transport to Afrétt and then an easy hike over moors and gravelly ground, including the light brown rhyolite around Urðarhólavatn, and farther on to Gæsavötn and Víknaheiði, before reaching Breiðavík inlet. The rhyolite mountains along the way display an incredible range of pastel colours. After a short stop on the black sands of Breiðavík beach with its Siberian driftwood, we hike up to Gagnheiði ridge (479 m), which has a viewpoint indicator and fabulous panorama. Then it is back to Bakkagerði after an eventful day with wide views over many of the area’s amazing mountains. Info: Rather easy day, walking about 12 km and traversing 400 m of elevation. We start the day with 3 hours hike in the village, Old turf house, concert hall, local fish factory, from rock to art, and many interesting stops are on our way. After a light lunch we hike on unmarked trails in the valley of Borgarfjörður. From the village, we take sheep trails up to Dimmidalur (the Dark Valley) and Jökuldalur (Glacier Valley) to see their rugged, beautiful landscape, right under the Door Mountains. Not only do we walk on our way through the elf community of Lobbuhraun, but come to their home in Dimmidalur valley. When we return to Bakkagerði village, we walk through it, noticing its many interesting aspects and of course also visiting the queen of the elves at Álfaborg (Elf Hill). Info: walking about 16 km and traversing 700 m of elevation. We start the day after transport to the environmentally friendly harbour of Borgarfjörður, Hafnarhólmi, to visit the puffins and other birds nesting there. Next we hike up from the coast through vegetated mountain screes to Brúnavík pass, at 345 m, and down to Brúnavík inlet. There we visit another beach of black sand, with lots of beautiful stones lying on it, and listen to the waves. After taking our shoes off to ford the small stream, we enjoy a relaxing barefooted walk to the other end of the beach. On our way back we hike over Hofstrandarskarð pass, 321 m high, and walk beside Helgárgil colourful canyon towards Bakkagerði village. Mývatn and Icelandic nature treasures. Info: Driving about 5 hours, Easy hike about 4 hours. After a good breakfast we will say good-bye to the peaceful Borgarfjörður and the local people. We drive towards Mývatn area and on our way we will stop at a newly rebuild turf farm in the highland Sænautasel. After a visit and refreshment we go further to Möðrudalur farm in the open space of eastern highland. Before we reach lake Mývatn we will hike in the smoking lava of Leirhnjúkur last active 30 years ago. From Leirhnjúkur we drive to the Hverir area with bubbling mud and smoking steam. We go over to the Mývatn Lake and enjoy their local food and visit their geothermal nature bath after an interesting day. The good night sleep will be at near farm holiday guesthouse. Info: After breakfast we drive to Iceland’s second biggest town Akureyri. Capital of the north Iceland and from there we fly to Reykjavík or if you like you can of course continue your travels in Iceland from here on your own. Flight from Akureyri can be in the morning or evening, it is up to you if you want to stroll around Akureyri and relax, or head straight to Reykjavik.